The vibe in the air was always electric. Applicants studied, passed the test, and jumped through all the hoops to become Americans. They were extremely excited. The attitudes of the immigrants I saw at naturalization ceremonies were far superior to those seeking to illegally invade our country. Illegal aliens disrespect our laws and the American people. They have no desire to embrace our culture, salute our flag, or learn English while exploiting our welfare system. Democrats and RINOs gift illegal aliens $135 billion annually in giveaways. The citizenship applicants I saw at naturalization ceremonies were a superior breed, with a desire to become a part of something great, lending their gifts, talents, and skills to contribute to America’s greatness. I’ve shared before about the 90-something-year-old applicant in a wheelchair surrounded by his family at a naturalization ceremony. The elderly applicant wore a suit. His family were also in their Sunday best. Obviously, this was a major family event – extremely important that he become an American before he died. When time came for the frail gentleman to say his Oath of Allegiance, family members on both sides lifted him from his wheelchair to his feet. A great grandchild held up the elderly gentleman’s right hand as he pledged his oath with the rest of the applicants. Upon the applicants completing their Oath of Allegiance, the hall always exploded into enthusiastic cheers, tears, and applause. At that emotional moment, my accompaniment music would start. I joyfully sang my “Celebrate America,” the first song heard by the extremely excited new official U.S. citizens. It was the proudest day of their lives. President Obama did everything in his power to undermine the special-ness of being and becoming an American. Obama undermined our heritage of self-reliance and rugged individualism. He wanted to addict as many Americans as possible to government dependency. This turned my stomach, folks. I wrote another song, “We Are Americans,” to remind people who we are, of the dignity and pride of being an American. Obama sent out a clarion call to foreigners to enter America illegally, bypassing legal immigration. Many in our military paid the ultimate price for the freedoms we enjoy each day. 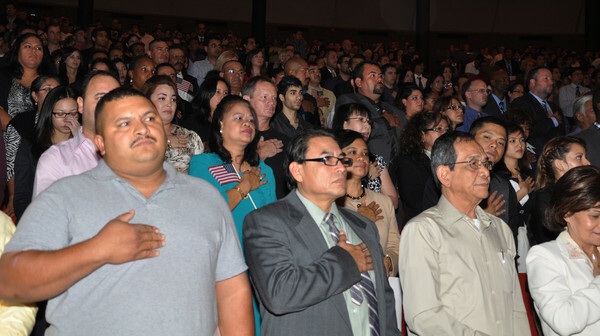 Yet Obama ended the requirement for citizenship applicants to pledge their Oath of Allegiance. Obama thinks we are rude for believing that America is exceptional. He believes that American exceptionalism is no more exceptional than the exceptionalism of any other country. Upon winning the presidency in 2008, Obama launched his I-apologize-for-who-we-are tour. He apologized to nearly 3 billion people across Europe, the Muslim world, and the Americas. Obama said our country is flawed and asked forgiveness for our sins. Outrageously, U.S. citizen students were sent home from school for wearing garments with a U.S. flag to school on Mexican holiday, Cinco de Mayo. School administrators concluded that wearing our flag (in our country) on a Mexican holiday is “incendiary” and insensitive to illegal alien students. Courageously, President Trump addressed the nation to say, “Thousands of Americans have been brutally killed by those who illegally entered our country, and thousands more lives will be lost if we do not act right now.” Trump called the invasion of our border a “humanitarian crisis.” As expected, Democrats and fake news attacked Trump, calling him racist. Thank God Trump remains strong, firm in placing America’s best interest first. Our president needs your prayers and support, folks. Every naturalization ceremony began with the singing of our National Anthem. A trio of middle school students was scheduled to sing it. When they peeped through the stage curtain to see an audience of over a thousand people, the students became terrified. Upon being introduced by the emcee, the kids marched to the center stage microphone and began singing. Suddenly, they froze and stopped singing in the middle of the song. I quickly joined the kids at the microphone. I explained to the audience that the kids had never performed for such a large audience. But rather than run away in fear, they gave it a shot. That is how we do things here in America. The audience erupted with applause. They loved the kids. The audience, the kids, and I all sang our National Anthem together. It was awesome. Immigration officials sent me a letter thanking me for turning an embarrassing moment into a moment of inspiration. Performing my song, “Celebrate America,” at citizenship naturalization ceremonies further opened my eyes to how blessed I was to be born an American. Democrats have deceived far too many of my fellow blacks into believing the lie that America is a hellhole of racism, where cops shoot blacks on sight and white America burns the midnight oil conceiving ways to keep blacks down. The truth is, America is the greatest land of opportunity on the planet for all who choose to go for it. The new Democrat-controlled House is fighting Trump tooth and nail to continue Obama’s policy of bypassing legal immigration. Democrats Pelosi and Schumer are hell-bent on keeping our borders open to illegals, endangering Americans while throwing away the dignity and pride of becoming an American. Becoming an American truly is and should always remain extremely special.